If you want to be a great home or party bartender, one of your best friends is ice. It’s one of the most over looked ingredient but one of the most essential. A common mistake in preparing a good cocktail drink recipe is not paying attention to the ice. If you’re using the ice from your freezer, it probably absorbed odors from the other frozen foods you store. The longer the ice remains in your freezer the greater effect it will have on the taste of your drink. Ice that has been stored in a freezer for a long period of time, at least a week or more has a slightly fishy smell. 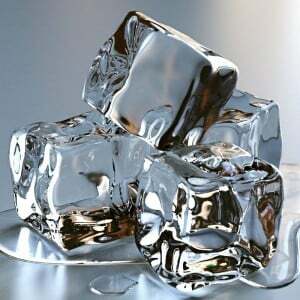 Bartenders at your favorite watering hole use ice from commercial ice machines. This ice is made with filtered water and stored in an ice bin. It’s not exposed to other food odors like you home freezer and is clear in color and has a clean taste. Like many other items, ice will absorb odors in the freezer. Ice that spent too much time to time in the freezer will give a cocktail an unpleasant fishy taste. If you live in an area with hard water, it will have a heavy mineral flavor. Buy a bag of ice that has been made with filtered water at your local convenience store. If you don’t use all the ice, seal the bag tightly to keep out those nasty freezer odors. Commercial softened water is another thing that affects ice. It uses large amounts of sodium and will add a salty taste to cocktail drinks. The type of ice you use will determine how diluted the drink will be from the meltage. Large cubes are good for drinks that contain clear non-sweet spirits, and not mixed with fruit juice mixes or cream. Small cubes are good for any drink that you shake. Crushed ice works best with frozen blended drinks. Experiment with different shapes of ice to determine what works best for you. At American Bartending School we prefer to use small cubes. They easily fill different types of glasses, are excellent for shaking cocktails drinks and melt quickly to chill the drink. Experiment with different sizes of ice to help you determine what best suits your style of bartending mixology.